Custom Cowboy Boot is handmade with oil tanned steer hide exterior combined with our finest moccasin-grade sheepskin interior. 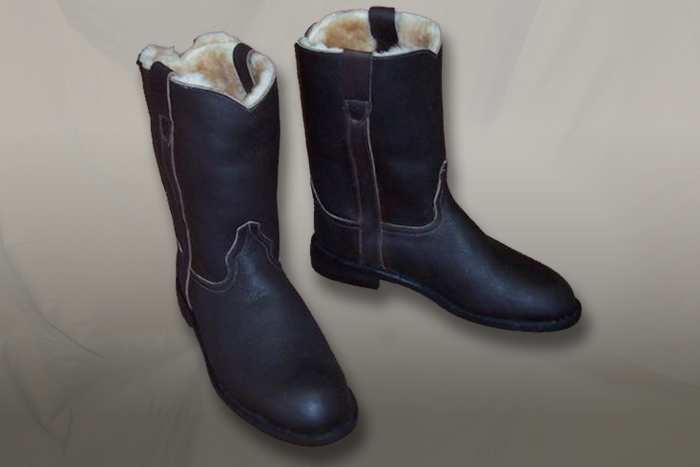 Looking for an American made custom sheepskin boot? Well your search is over. Quality Oil tanned steerhide combined with the finest moccasin grade sheepskin make these custom boots something that you will wear with American pride for years to come. Each boot is handmade to fit your foot. Our cowboy boots are working boots, built to be worn by a Rancher rather than as a walking boot. The exterior is made of steer hide laminated to a fullskin sheepskin lining the interior and a hard sole similar to a vibrant sole. When we receive your order, we will send you instructions on how to provide your exact foot size. Please allow 6 weeks for delivery for these Custom Cowboy boots.